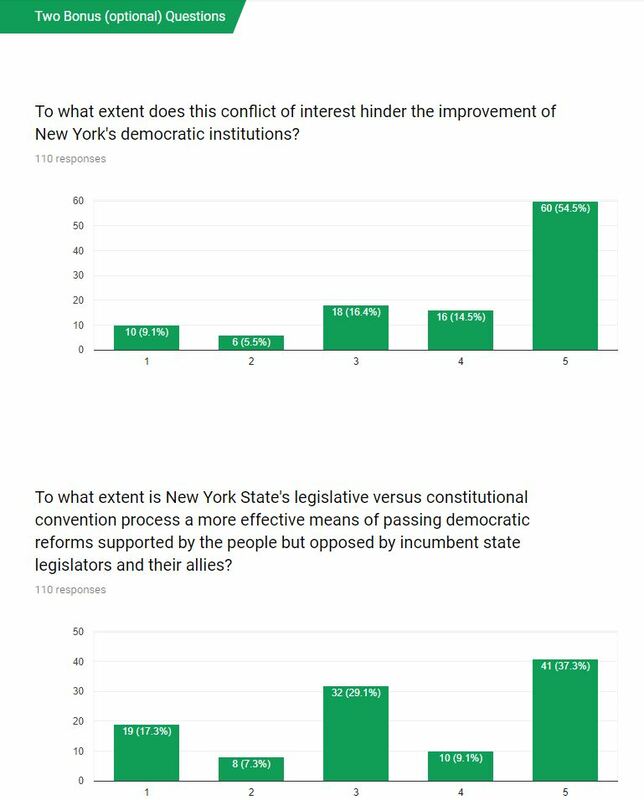 Introduction: This page reports the results of a New York State Constitutional Convention Clearinghouse reader survey during late summer and early fall 2017. It is not a scientific survey, as the 115 respondent were a self-selected group. Some of the respondents undoubtedly replied multiple times because, until this report was posted, the only way to see the results was by filling out the form. The survey is now closed. Thanks to those who responded. Respondents were roughly equally divided between referendum supporters and opponents. Click on a toggle button to see the detailed results for a particular question. 1) HOPE it would accomplish? Limit debt bonding by State Authorities and require legislative approval. Make the budget process transparent. An independent redistricting commission to minimize gerrymandering. I do not think the constitution needs revision. Ethics reform. Campaign Finance reform. Anything of the variety that empowers the people more, and forces Albany to listen to the little people. I don’t think it will accomplish anything good. Anything that needs changing can be done through legislation and introductions of bills. There is no good thing that can come out of this except to let spiteful organizations rip away more of New Yorkers and especially public employees rights and hard earned retirement benefits. Something meaningful to ALL State citizens. Non socialist agendas. Make it easier to impeach and or remove political leaders. Hope more information and time to digest all proposals. Then enact changes slowly as to be far to those who are affected. Have true time limits on the length of time someone can collect welfare. The current 5 year limit is not a true time limit and has caused N.Y to become a dumping ground from other states that have stricter guide lines. Reducing the size of state, counties and local government. Electoral reform such as proportional representation for State Legislature, forbid gerrymandering, majority-winner-requirement for single winner elections. Create fairness for all. Make parents more accountable for their underage children. Change laws that are outdated, such as government employees getting their wage throughout imprisonment etc. Our money can go to better causes. Dismantle the power structure embedded in Albany and allow for more regional laws to accommodate the different needs of NYC and upstate. Establish a means of taking some of the power away from ineffective and corrupt legislators. I hope it will change gun laws. Serious electoral reforms to give the voters of New York more power. We need nonpartisan election administration, nonpartisan elections and the right to Initiative and Referendum. Ethics reform and curbs on labor bill of rights like guaranteed public-employee pensions. The ability for legal residents to have our voices heard according to our constitutional rights. The ability to tell the powerful NYSUT that their fear mongering is strangling our state and that they do NOT get the final say of control over our state laws. Give the people more control and revamp the Judiciary. I am opposed to a SCC. Giving more power to the voters of the state. I hope it will be defeated. Delegates elected that are actually for the people and progressive. Election reforms & govt transparency/structural reforms most imperative; and hopefully strengthen rights of criminal defendants, reproductive rights, environmental rights. Make the state less corrupt, make it instead work for the people. Ending “three men in a room” permanently. Unicameral legislature, weaken the hold of government and teacher unions, term limits on all elected officials including judges. An end to LLCs being created just to fund political campaigns. They must be engaged in legitimate businesses and show that contributions come from the business profits. Increasing government employee contributions to their own pensions. Eliminate tenure for teachers. Strict penalties for any political official who breaks the law, regardless if it has to do with his or her duties. Prohibition against anyone who committed fraud from running for office. Legal right for women to choose to have an abortion. No excuse absentee ballots One year residency for voter registration and a required score of 100% on a test of the potential voter’s knowledge of the political structure in the community. Term limits for all municipal elected officials. Reforms to redistricting. End to gerrymandering, term limits, ethics reforms, initiative & referendum, eliminate draconian voter registration rules. 2) FEAR it would accomplish? Changes in funding for education particularly accommodations for children with special education needs. Token treatment of measures to prevent corruption in government. Nothing, It’s not like a convention automatically means the proposed changes happen to the constitution, that gets chosen by a vote 2 years later. If we’re stupid enough to vote AWAY our rights, we don’t deserve to have them. Cut spending in areas that I do believe should be cut in order to free up more money in the state. severely reducing pensions causing people that are unable to find employment due to age to struggle financially. It will be a major assault on public employees, their working conditions, and their retirement benefits like pensions and healthcare. Partisan desires to change existing law to detract from NYS citizens security. Fear proposed changes will do as little good for most. Changing that which most cannot prepare for in a little time as change will come. Strip public pensions from those who are currently collecting pensions and have worked very hard and earned those pensions. Pension changes need to be made but not at the expense of people who are retired and those who are currently working and vested in the system. cut my NYS retirement benefits i.e. pension, and health care as well as increase the cost of health insurance. Change NY, a haven for successful worker/employer relationships, into a haven for no worker rights. New Yorkers could lose their pensions……. Destroy public education to line the pockets of the charter school supporters; irrevocably damage the natural beauty of our state while polluting our water and air. Enshrining special interests that perpetuate corruption in Albany. Changes that limit people’s rights and narrow the view on social issues. Elimination of collective bargaining, pension protections. Destroying public pensions that many have worked very hard for and rely on. Degrade and reduce pensions of all NYS employees. More legislative power, more costs to the middle class. Further entrench the power structure and damage public education. Result in the status quo. I feel it will impact the pension system of unionized workers. I do not want to lose any of my pension but need to learn more about other issues involved including ethics, term limits and ballot access. I am not concerned because I have faith that the voters would vote against any eggregious change to our constitution. Changes to existing pensions that people rely on. Fabrication of spurious rights like a right to clean water/air. Special Inetrest Groups could elect their own delegates. Wreak havoc in NYS with items, policies, traditions, etc. much like the way Trump’s administration is currently helping ONLY the wealthy, not the middle class. This especially applies to the NYS Parks, and the NYS Retirement System. I fear it would compromise the pension I have worked for. Special interest, lobbyists and big money having a free for all of the NYS Constitution. Entrench partisan power and political patronage; effectuate neo-liberal compromise of existing constitutional & governmental principles rooted in the political momentum of a much more progressive era; rob Peter to pay Paul (remove, narrow or weaken existing mandates and protections to shore up funding and establish “mandate” for politically-popular, majoritarian, and/or “pet” causes). Make it even more corrupt, get rid of protections of workers, population. Removal of existing protections against abuses by big business such as protection of Adirondack Park Preserve. Lock into permanent lower tax rates on the rich. Increase the bar for any legislation to be passed by the Assembly and Senate. That the con-con will open workers rights, benefits and pensions. 3) EXPECT it would accomplish? Regulatory reform and consolidation of State Authorities and economic development corporations that often have competing interests. Fix it! There is a reason New York State consistently ranks last in attractiveness for new business development. We’ve been bribing companies to locate here and we can’t even buy them enough to get them in New York State. Our tax and regulatory structure is just too adverse for business development in NY State. Fix it. Not much if career politicians are the only delegates. Eliminate civil service pensions and any other social service that the constitution guarantees. I expect it to create a lot of rapid changes. During the past 20 years the world has advanced rapidly, far more rapid than it has in the future. We now have much greater technology we can use in the governing process. Make a few popular changes for the average citizen that will hide small calculated changes that will disproportionately benefit the “rich and powerful” over the long run. nothing but upset the financial security of people depending on their pensions. Long standing issues and statutes that threaten quality of Life. Return to Rule of Law in New York State. Cannot expect anything other politicians doing the same and not really helping people. Unsure at this point. Because of the blame game that is played, I worry that delegates will not be open minded and strictly in the game for their own personal agenda and damn everyone else. Reducing the size of government and mandates. Amend the rules for serving as a delegate. serve special interest groups with deep pockets in major metropolitan regions. I would hope that all citizens have an opportunity to voice their opinions–not just lawyers and politicians. If the state voters are truly paying attention? Not a damn thing. Nothing. Historically, its money poorly spent and since all legislation has to be voted on again, seems that the regular legislative process can accomplish the change we want. Create more fairness for all people. More equal say for all. Very little. Delegates are chosen how–by the government officials themselves, the very people the constitution regulates! Honestly, everything is moderate in the end and some issues may be revamped. Most likely it will end up costing the NYS taxpayer too much money and nothing will get done. But my glass is half full, I do love NY. Some moderate changes that would be in keeping with the times that would have a chance of being approved by the electorate. Bring about at least some positive change in getting things accomplished for New York State. I’m not sure. I need to learn more. That’s what I’m trying to do. Some ethics reform. Some labor-rights reform. Teach generation to take next con-con more seriously. BTW you’ve hijacked Excelsior to fit your notion of progress. Is that fair? The same as what I HOPE it will accomplish: The ability for legal residents to have our voices heard according to our constitutional rights. The ability to tell the powerful NYSUT that their fear mongering is strangling our state and that they do NOT get the final say of control over our state laws. What I fear it will accomplish. Not much. I expect that if it happens, there will be some meaningful deliberation and some less meaningful grandstanding; and that the yield to the voters will likely be a bundled compromise proposal (or a handful of compromised proposals grouped by subject matter area); and that the voters will not approve these proposals. To the question below, legislative conflict of interest is a genuine hindrance; but the legislature is already so subjugated to executive and partisan power in New York that it seems all that really matters is whatever interests the executive. It is hard to see how a convention, in which legislative power is diminished, will not cede power to the Governor. Even though this is the case in which he has no official say, his power as leader of the majority party and the state’s major political patron does not seem to be registering with many people. To the final question: neither seems particularly effective. There is a benefit to circumventing the legislature and executive, if that is really an attainable aim of a convention; but there is also risk in limiting the winnowing influence of political representation when seeking to amend our charter documents for posterity. Have a vote on getting rid of corruption of big money in politics in 2019. Nothing. Not that I have no expectation, but that it will fail to accomplish anything except wasting taxpayer dollars on the Constitutional Convention expenses. Add complexity and enshrine corruption. Don’t’ know. It really is contingent upon WHO makes up the 204 delegates. Difficult to say — depends on how much money is poured into the process. I expect that as usual nothing would be accomplished to assist the residents of New York State. dont know… its been too long….. I expect the new constitution would put to bed the ancient arguments that have been endlessly debated. Nothing. $50-100 million worth of nothing to be more precise.